Discussion in 'Gen 7 Discussion' started by gengar17, Apr 19, 2017. Discuss the possibility of Metagrossite being banned from the SM OU tier. Use this thread to discuss Metagrossite’s effect on the metagame. Talk about the different sets it can use, possible partners and team support, and potential checks and counters. State your opinion on whether you think it should be banned or if it should stay in SM OU. All opinions are valid, and discussion amongst players is not only allowed but encouraged, provided your judgment is backed with sound reasoning and validation coming from experience having played with / against Metagrossite in the tier. Do not simply say "it's broken" or "it's not broken”, and do not make arguments via theorymoning. Check out this Guide to Suspect Posting before getting started if you are unsure of anything. Happy posting! Kingler12345, La.Melle2402, Casparov and 2 others like this. Hurricane, snaga, Kingler12345 and 6 others like this. Mega Metagross can often be a hard Pokemon to play against. Anyone can tell you this. The Mega speed buff this gen made it far easier to revenge kill things like non scarf Garchomp/Keldeo/Lando-T, Heatran, Hoopa, the list goes on. 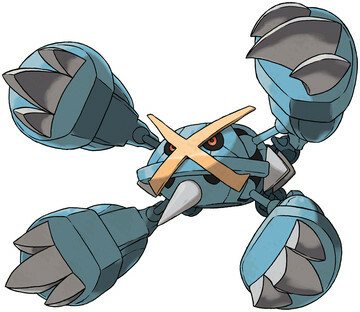 Not only this, Metagross can 2hko almost everything that isn't a physical wall and thanks to it's decent movepool, it can sometimes be hard to know what it's running. Thunderpunch can still OHKO Gyarados at -1, as can ice punch vs Landorus-T.
Also let's not forget, Meteor Mash can give Metagross attack boosts which can easily win games. Mega Meta also has base 150 defense and 110 SDef which makes it bulky enough to survive attacks. Great natural bulk, even without investment, have incredible 80/150/110 defenses, which make Metagross-M a natural offensive tank. Good speed tier,the mega speed buff did very well to Metagross-M, which can now mega evolve safely, as it is an immediate threat to the opposing team. Tough Claws provides a 1/3 boost for every regular move except Earthquake. Speaking of its movepool, its biggest '' flaw '', the 4mss, is actually a very high risk factor for the opponent, since the only really guaranteed move is Meteor Mash, and all the others 3 represent very much coverage making Metagross-M unpredicable. Have acess to priority Bullet Punch. Metagross-M takes advantage of all Terrains in metagame. (Electric; Prevents Asleep and Thunder Punch boost. Psychic; Immunity against priority aka Sucker Punch and Zen Headbutt boost. Grassy; Reduces Earthquake weakness and recovery. Stealth Rock and Agility/Rock Polish are just niches, but still usables. This whole set of factors makes Metagross-M a Pokémon that exceeds the OverUsed tier, so it need be banned. Congrats PO, for not waiting for Smogon to do what it should have done already 2 months ago. We have decided to ban Mega-Metagross. Atli and fsk like this.